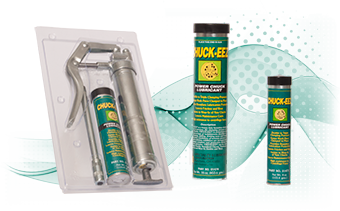 CHUCK-EEZ is a heavy-duty boundary lubricant designed to increase the clamping pressure of Power Chucks. CHUCK-EZZ is formulated with a high percentage of molybdenum disulfide to reduce seizing, galling, fretting wear and to prevent reduced friction under conditions of extreme pressure. Rust and oxidation inhibitors are incorporated to maximize complete rust protection during the life of the lubricant. CHUCK-EZZ can be used on Power Chucks, Standard Chucks, Fasteners, Press Fits and Wear-Guides and Ways. It is able to withstand pressures up to 500,000 pounds per square inch. And the tacky nature of the product gives it high resistance to centrifugal force. CHUCK-EEZ is sold through a worldwide network of stocking distributors. Use our finder to locate a distributor near you. We provide the Safety Data Sheet (SDS) for CHUCK-EEZ as guidance for proper handling procedures when using it at your workplace.